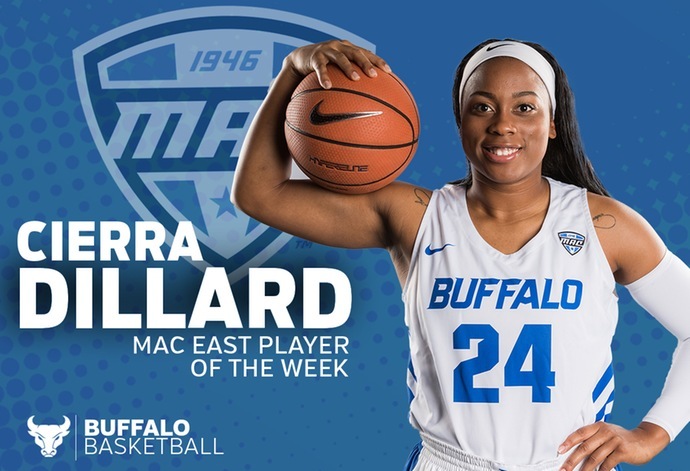 BUFFALO, N.Y. -- For the second straight week, University at Buffalo senior guard Cierra Dillard was named Mid-American Conference East Division Player of the Week following her outstanding performance in Las Vegas over the weekend. Dillard averaged 26.5 points, 7.5 rebounds, 5.5 assists and 5.5 steals in wins over Georgetown and South Dakota State at the Southpoint Shootout in Las Vegas. Against the Hoyas, Dillard posted a season-high 33 points on 8-of-15 shooting, 4-of-5 from beyond the arc and a perfect 13-for-13 from the free throw line. She also added six rebounds, eight assists and five steals against Georgetown. The next night, she scored 20 points and added nine rebounds and six steals, both season highs, against South Dakota State. 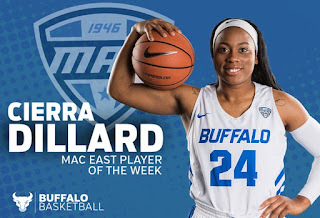 Dillard leads the nation in scoring, averaging 26.6 points per game and has helped lead the Bulls to a 4-1 start to the season. Buffalo will be back in action on Saturday at Central Connecticut State.